Drug-Coated Balloons - Bernardo Cortese M.D. -A randomized controlled trial of new-generation DCB vs new generation DES for the treatment of small coronary vessel disease: a spontaneous, multicenter clinical trial. You can find the study protocol in this page. -the Falcon Registry: a prospective registry on the In.Pact Falcon (Medtronic) DCB, for any coronary clinical indication. This is a multicenter international registry. I am the Italian P.I. for this study. You can find the study protocol in this page. -The Italian Elutax SV all-comers Registry: a retrospective multicenter registry on the use of the Elutax SV DCB for coronary applications. We are the coordinating center for this national study. -The DCB Restore Registry: a retrospective multicenter registry on the use of the Restore DCB for coronary applications. We are the coordinating center for this study. I have the dream of running it internationally, and I’m working on this item. I am proud to inform that FASICO NATIVES has been accepted for publication in the Journal of Cardiovascular Medicine. After FASICO and NANOLUTE’ this is a crucial piece for the assessment of the safety and efficacy of Magic Touch sirolimus-eluting DCB. In this study, which will be available soon for the readers, we have conducted a core-lab assessment of the angiographic outcome of SCB for native coronary vessel disease. With more than one third of patients showing late lumen enlargement (just like the top-in-class paclitaxel DCB), the average LLL was 0.09mm in this cohort of consecutive small-vessel-disease patients. Core lab analysis was performed by Cardialysis (Rotterdam, NL). 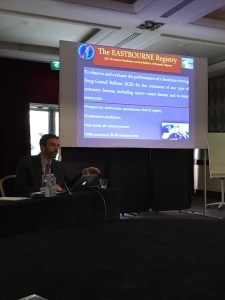 …waiting for the interim analysis of the EASTBOURNE study, 1043 patients, to be presented at EuroPCR 2019 as late breaking clinical trial! Recently, a meta-analysis by Katsanos et a. showed an increase in late mortality after paclitaxel administration (either with DES or DCB) in the peripheral field (SFA). The topic is hot and deserves a deep analysis of the available data. For the moment, our position regarding DCB is that the technology, if used in expert hands and following the available position papers, is safe and effective for the treatment of lower extremity disease. Please, take a look at the recently published editorial of F Fanelli, T Zeller and myself in the Journal of Endovascular therapy. A new pubblication about “Nuove tecnologie e applicazioni per il pallone medicato nel 2017” has been published on G Ital Cardiol 2017. 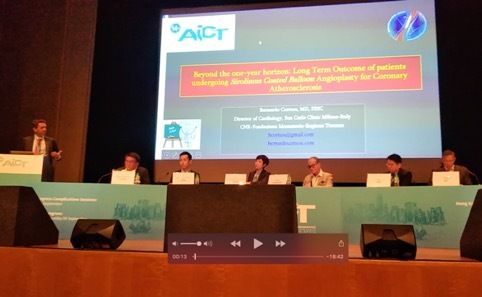 I DCB sono in grado di superare alcune importanti limitazioni degli stent senza perdere la capacità di inibizione della proliferazione neo-intimale, ma deve essere chiaro che questi costituiscono una componente della strategia di rivascolarizzazione ottimale per i nostri pazienti, sempre più complessi, piuttosto che un’alternativa ai DES. Mentre il loro ruolo nella ISR è ormai ben defnito, il trattamento di lesioni de novo, specie nel distretto coronarico, è la nuova frontiera e presenta ad oggi dati incoraggianti, ancorché preliminari. In ambito periferico, tali risultati sembrano non subire effetto di catch-up a 2-3 anni e si possono estendere sia a lesioni TASC A/B sia alle più complesse TASC C/D, così come alle sottopopolazioni di pazienti con lesioni severamente calcifche, dove l’aterectomia costituisce un valido alleato del DCB, o la ISR. I diversi DCB attualmente in commercio differiscono per la tecnologia che ne è alla base e, pertanto, hanno fornito risultati differenti in termini di effcacia a lungo termine, il che suggerisce l’assenza di un “effetto di classe” per i DCB in generale. Ogni differente tecnologia ha l’obbligo di dimostrare la sua effcacia e sicurezza in studi di adeguata ampiezza, qualità e rigore che possano confermare l’utilità nella pratica clinica dei dispositivi che entreranno in commercio da qui in avanti. 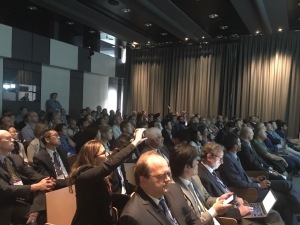 During the EuroPCR 2017, I have presented theOne year clinical outcome of percutaneous treatment with Sirolimus eluting balloons: Results from Nanolute prospective registry. Prospective, Multi‐center clinical registry real world, all comers patients at various indian Interventional Cardiology Sites. Clinical Follow-up at 1,6 and 12 Months. SCB might constitute a new therapeutic option, considering the overall complexity of modern-era interventional cardiology. The results of this registry, performed in indian patients, are encouraging, but deserve more complete clinical assessment in broader patients populations. …and PICCOLETO II becomes international! Fernando Alfonso, MD, head of Cardiology at Hospital La Princesa in Madrid, just confirmed that his center is ready to enroll patients at PICCOLETO II, that thereafter today becomes international! DCB for peripheral use-now published the International DCB Group Position Paper in the European Heart Journal! A few months ago, an expert panel lead by our group published the International Positioning Document on DCB use in peripheral interventions. The document was published in the European Heart Journal. A few weeks ago, our study on DCB in native coronary vessels left with a dissection was published in JACC Int, and we had the honor of receiving a dedicated Editorial from 2 experts on the field: R Byrne and M Joner. Their conclusion was different from ours from several points of view, so we deemed necessary to underline further aspects and we wrote a Letter to the Editor. This important paper from our group was just published in JACC Interventions, and commented on TCTMD. My interview at CX Vascular News!! This is the link for my interview at CX Vascular News, one of the world leading websites on cardiovascular medicine. The interview has been just released. It is a sort of personal opinion on drug-coated balloons. Enjoy the reading! !